Art In Motion LLC Custom Motorcycle Kits can be titled one of two ways. 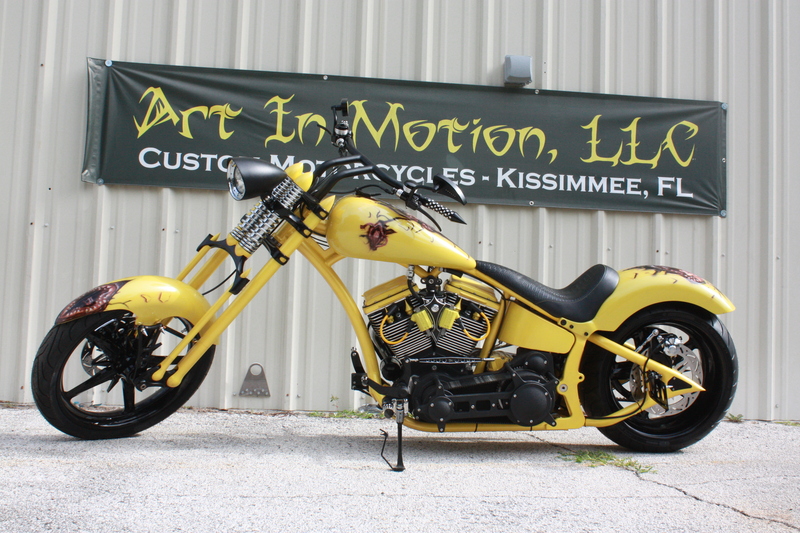 If the motorcycle you design is built in our shop under the "Build Your Own Bike" program where you work with our mechanics on the build itself, then we will assign a 17-Digit Federal Art In Motion, LLC VIN from our Kissimmee factory to the motorcycle. A Federal VIN makes it easier, in general to get insurance from companies like Geico or Progressive Insurance, easier to get financing (well that still isn't THAT easy in this economy), and easier to title and register. Call us at (407) 847-0119 to start this process. BUT, not everyone wants to build their motorcycle in our shop, so below is what we know about the Florida State Special Construction Title process. An ASPT motorcycle is harder to insure, needs to be financed with a personal loan (generally) and is much harder to title. Not impossible, but it can be frustrating and lengthy. If you want to purchase a custom motorcycle kit and assemble it entirely on your own, it will be considered an "assembled from parts" or "Special construction" motorcycle. You will need to keep good records of all purchases in order for the vehicle to be titled. You will fill out the application for certificate of title form and take it to your local tax collector's office. You need to fill out a builder's affidavit and maybe an additional sheet . This sheet requires that you sign an affidavit that the vehicle will not be used for general daily transportation but will be maintained for occasional transportation, club activities, parades, tours or other functions of public interest and similar uses. You will also need to state that the vehicle meets state equipment and safety requirements. Refer to 320.0863, Florida Statutes for additional details. Notice that the builders's affidavit requires that you attach the original MSO, bill of sales(s) or receipts for all major component parts and this must include the name, address and telephone number and signature of the seller of the parts. The seller cannot be eBay, PayPal or an individual - it must be a real store. If a frame was part of a previously built motorcycle then you MUST have the title to the motorcycle and it cannot be a motorcycle that has had a certificate of destruction issued. If the frame was built by a frame manufacturer, then you MUST produce a Manufacturer's Certificate of Origin for the frame.